1. It is okay to step back from your normally busy schedule and take some time to renew your mind, body, and spirit. Many of you know that May was one of the busiest, but most exciting, months of my life as school was coming to a close and Brave Heart was marrying Beautiful Soul on the same day as the last day of school. The wedding preparations and end-of-school preparations kept me on my toes for the last month or two of school and forced me to have laser focus when it came to scheduling and planning my days and nights on the farm. In the end, I learned that my friends, family, and God were even more amazing than I already realized and learned to lean on all of them a bit more to help me get everything accomplished that needed to be done. It was such a blessing to allow other people to step in and use their own talents to fill in the gap for me when I couldn’t do it all on my own. I have always struggled with trying to control every aspect of my own life and the lives of my own little family, so it was good for me to rely on others and watch their abilities come to life in order to serve my family. I am truly blessed. 2. Sometimes, farm life can be difficult. We have, unfortunately, had a tough month with our animals. A stillborn calf. Some favorite pigs missing. Other animal calamities in addition to grueling heat and very little rain. Thank goodness, our evenings on Green Acres have been really beautiful and unusually pleasant due to the wind that blows across our land. I am ready for cooler temperatures, to be sure, but I will have to wait quite a while to get that wish. 3. Catching up with close friends is invigorating and key to a healthy mind and heart. Our busy work and farm schedule make it difficult to visit with my friends, but I have made it happen several times this summer and I am grateful for the way my friends fill my heart with hope, happiness, and love. There are still several get-togethers coming up that I am really looking forward to and can’t wait to experience the joy I have when I am with my friends and for weeks thereafter. 4. I can only be lazy for so long before I feel yucky and lethargic. Don’t know how else to word that. I literally blocked off the entire month of June and religiously guarded it from a busy schedule. I have had more pajama days than I ever thought possible! (See Pajama Days post!) https://greenacresadventure.com/2018/06/20/pajama-days-on-green-acres/ Although I needed this mental and physical break, I am ready to be back on a more normal schedule beginning tomorrow!! During the month of June, I have read children’s books and free novels on my Kindle, enjoyed gallons of sugar-sweetened-coffee, eaten whenever I desired for every meal, called my sweet mom and my friends throughout the day, and written blogs to my heart’s content. I haven’t accomplished much on the home front and The Outdoorsman has handled it like a champ. He knew I needed this break and was all in from day one concerning my June “sabbatical” from work around the house. I did, however, help feed all of our farm animals each night when he got home…except during Pajama Days!! I had a full sabbatical during those days!! 5. Farm animals and the work it takes to keep things alive and healthy seems to never end. You must keep pushing through even if you don’t feel like it. I honestly despise the hot weather of our Texas summers. Give me winter weather and I am a happy girl! It is ironic that summer has never been my favorite time of year even though I am a lifelong teacher and out of school during the summer. I just don’t like to sweat and I absolutely hate having to wash my hair due to sweating too much!! On a farm, the unfortunate truth is that if it’s hot outside, the animals need you even more. They are probably hotter than us in most cases. Our adorable KuneKune pigs do not sweat so they need water and mud to cool themselves off. Each afternoon, we have to spray water into our six different pig pens to keep them all cooled down and comfortable. It takes a while to get food and water into all six of our pigpens, but it is urgent and necessary for their health. We also have two different chicken coops in two different locations and have to make sure the chickens have enough water as well. We are working on consolidating and improving our animal pens and coops, but for now we are doing a lot of watering and feeding every day. 7. Learning from your mistakes is vital. We have, unfortunately, had several sad things happen in the past month that were all due to our lack of experience concerning certain animals and, at times, lack of time to focus on seemingly small details on the farm. 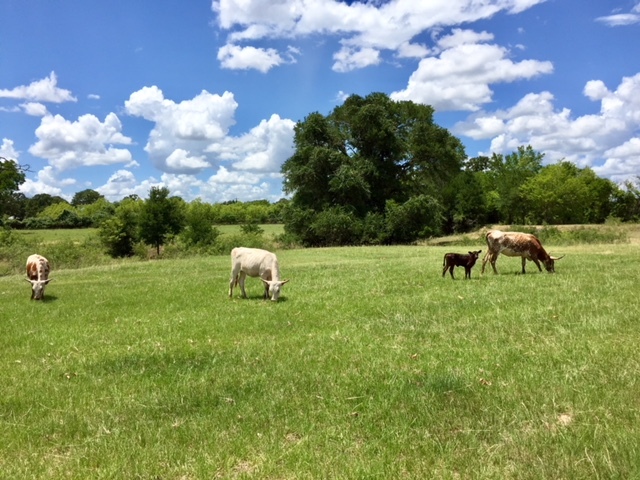 We have lost a baby calf because the bull her momma was bred with was too big and the heifer was unable to give birth because the calf was too large. The heifer almost died as well, but thank goodness, she seems to be getting stronger now. It was a really sad, hard experience for us after the anticipation of an adorable baby calf. We also had seventeen unexpected piglets born from a wild boar breaking into our pens even though it was wired with electric fencing. (Nature is strong, Folks.) We also lost one of our favorite momma pigs, Miss Piggy, when she ran away with one of her babies. We know exactly where she got out and had planned to patch that hole more than one time, but got distracted and busy with the tyranny of the urgent. Through these sad experiences, we are learning to scale back and focus on details and make Green Acres better every year as we move forward. 8. Keeping a sense of humor is important. This is the key to happiness on Green Acres, in teaching middle school, and in life as well. If The Outdoorsman and I didn’t have a sense of humor about ourselves and our adventure on the farm, we would have been completely defeated by now. So many things have happened during our 2 1/2 year journey on Green Acres. Most of the things have been amazing, some of them have been sad, but many of them have been hilarious. We should have put a live-streaming camera on the post in front of our house so people could see the hilarious interactions we have had with our dogs, cats, piglets, cows, donkeys, sheep, and chickens all surrounding us at once like it is the most normal thing in the world as we are trying to grill, work on things, take a walk, and more. They keep us laughing with their curiosity and desire to be close to us at all times. Yes, we are a food source, but they follow us even after they have eaten their fill. It is obvious they just want someone to hang out with. We are looking forward to many more years and many more lessons learned on Green Acres as we walk this journey with one another, our family, and our friends. Thank you for your kind words, helpful advice, and loving support on our Green Acres Adventure. We appreciate you all so much! !